For this lesson we’ll be learning Hot Cross Buns. We will learn the song by ear and then walk to the beat of the song, clap the rhythm of the words and then do some other rhythm exercises. I hope these are helpful! The 4th video at the bottom shows how you can extend this lesson further for an advanced musician. 1. Teacher may want to preview the 3 videos in the beginning so you know what to expect. Try looking ahead on Saturday or Sunday of the week you do each lesson! 2. Print Two Rhythm Documents if you have children with a musical ear or that have had any private music lessons. These will be used during Part Three of the lesson for intermediate students. 3. If you haven’t watched the Intro Videos, please watch them here first! I you would like to print the text of this lesson you can find it here. Please feel free to pause the movie until you have the song learned, although I believe that if you continue through the lesson videos you will get the song learned over the 10 minute lesson. If you have younger children, feel free to just do video 1 and 2 and then review those concepts for another 5 minutes. Once you have watched this portion, feel free to end here if you only have young Form 1 (1st and maybe 2nd grade) students. Play with the song, sing it and explore the beat with Drums, rhythm sticks (wooden spoons), Shakers, and Dancing. Get the feel of the beat into your children. If this portion is simple for your children because you have done a lot of music in your family, then you can use Part Three below to complete your 10-15 Minute weekly Sol-fa Lesson. ​Mason did Sol-fa 2 times per week for 20 minutes in Form 1 and 1-2 times per week for 20 minutes in Forms 2 and up. I realize this is hard to fit in sometimes, so start small and gradually add more music time in your week as you grow in your love for the lessons. If you want to do two lessons per week, then you will just move faster through the content. If you can’t fit it in to your morning lesson time, encourage your children to sing the songs and do the activities in the afternoon time! 1. Walking to the beat while at the same time clapping the rhythm of the words. This is more difficult and will take some practice. But the more you play at this with your children the better they will get at doing it. My son is 6 and after doing it the last few weeks, he’s picking it up. Don’t get discouraged if it takes awhile and don’t force your younger children( especially your preschoolers and toddlers) to do this at first unless they are really wanting to try. ​2. Basic rhythm reading. We look at the rhythm from the song as written music and also do some rhythm drills with syllables. Six-year-olds who are learning to read books right now in school might be excited and ready to try this activity. It’s not hard and pretty fun, but will also take practice. Don’t expect perfection! Just do your best together. Have them follow the written music with their finger as we do. Please see the Part 3 Video for a clear understanding of how to use the Rhythm Patterns and Hot Cross Bun Rhythm print out. If you print these documents off for your family, you should be able to just follow along with us in the video. The Duple Rhythm Patterns will be used over multiple lessons. 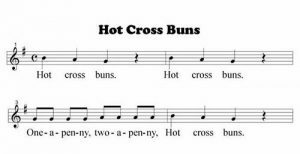 You sing: Hot Cross Buns, (rest) Hot Cross Buns, (rest) One a penny, Two a Penny, Hot Cross Buns (rest) – 4 beats per measure. ADVANCED LESSON: This is a video to show how to extend this lesson with older, advanced students. This doesn’t involve harder sight singing pieces yet, but allows the older student ( who can already sight read from private lessons to practice their inner listening skills and to try and dictate rhythm and pitch in music. This is the Rhythm lesson. Pitch Dictation will be covered in Lesson 2. Challenge to the older students… Can anyone find my mistake? You can find Free Staff Paper to print here.